On Friday, October 20 I left the Villa Thébaïde to be “one the road again” towards Portugal. On the way I stopped in Martigues at PSI to make change the rear camera where I met a crew with which I had had an appointment at the border of Costa-Rica, here. I left Martigues around midday to bivouac on a service area little before the Spanish border without control, Space Schengen. 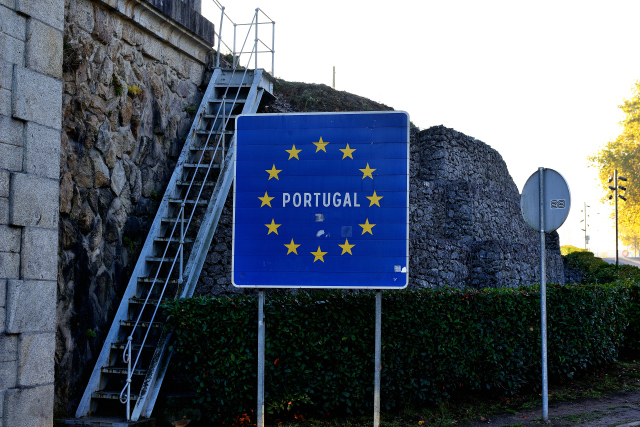 On Saturday morning I gave up without regret the carpark in the rain to stop at 19:30 on the small carpark in Tui at the border of Portugal where already two British motor homes were, Brexit is not instituted yet! To prepare the visit Portugal I remained on Sunday under a timid sun at 17 m of altitude. I had traversed 1,560 km in two days. 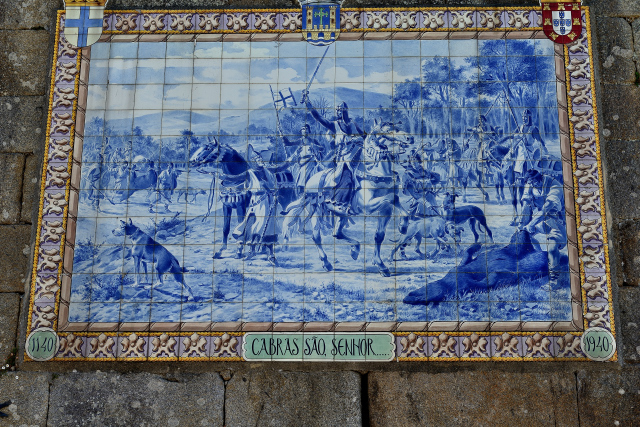 The town of Tui is a stage on the road of pilgrimage from Porto to Santiago de Compostela. On Monday, October 23rd I entered Portugal by a Eiffel bridge with a jet lag of less one hour with France, indeed the standard time of Portugal is that of the meridian line of Greenwich. The day was announced sunny with a little of fresh air. This first day I played it small-arm to take my reference marks by traversing the valley of Minho, border with Spain. 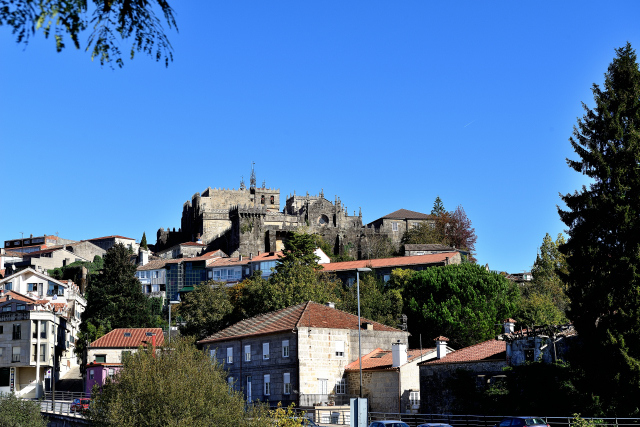 Valença is the twin city of Tui on both sides of Minho. They are two strengthened cities as of the 14th century to guarantee the independence of the two states. 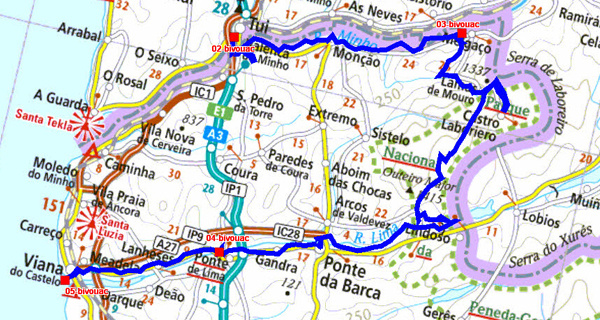 Moreover the two other cities of the valley are also strengthened in Vauban, Monçao and Melgaço where I establish my bivouac as of 14:00. On the way I made a detour to take height at Monte de Faro. I thus stopped early because it would seem that on Mondays all is closed, except the churches, God is always available for his flocks! The day of October 24th was dedicated to Serra da Peneda which enabled me to explore a castle in ruin and especially of spectacular attics with grains, espigueiros, made out of granite perched on piles and surmounted by Christian crosses for the drying of the grains. On the way after the rise to the castle I climbed the 300 steps to Santuario de Nossa Senhora da Peneda for the discharge of my faults! I failed harassed at Ponte de Lima to admire a splendid Roman bridge of 277m length and 16 arches for 4 meters of dispatcher. Admittedly it was restored at the 14th century. 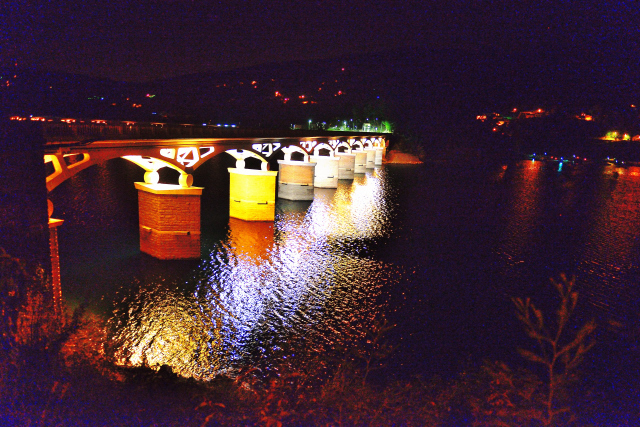 To reward me I settled at the terrace of a coffee shop vis-a-vis the bridge to taste a glass of Vinho Verde, refreshing! Then I parked the truck at the edge of the Lima river for one night repairing after administrative work. The city is turned towards the sea between the river and the mountain. It owes its wealth with the trade to Brazil. 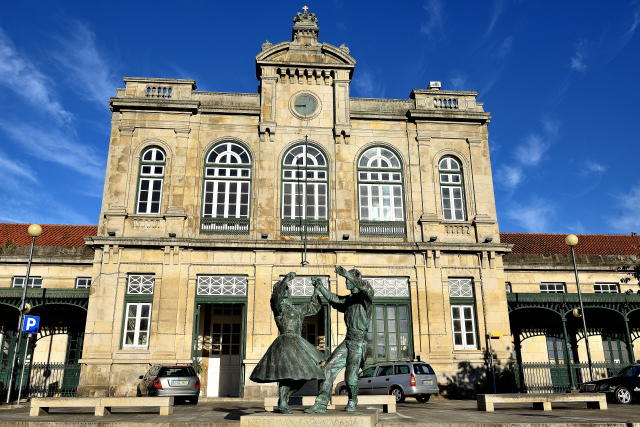 The historical center organizes itself around Praça da Républica bordered with pretty houses of Manuélin and Renaissance style. Old town hall remains only the face beside the hospital of the Mercy whose church offers covered walls with azulejos and the gilded wood high altar. Of course other churches attract tourist in search of place of meditation. East of the city in the absence of a Roman bridge a Eiffel bridge is spanning the Lima river. I did not visit the museum of decorative Arts due to the reason for No Photo. I establish my bivouac on the immense carpark at the edge of the river by lazes to seek another place. 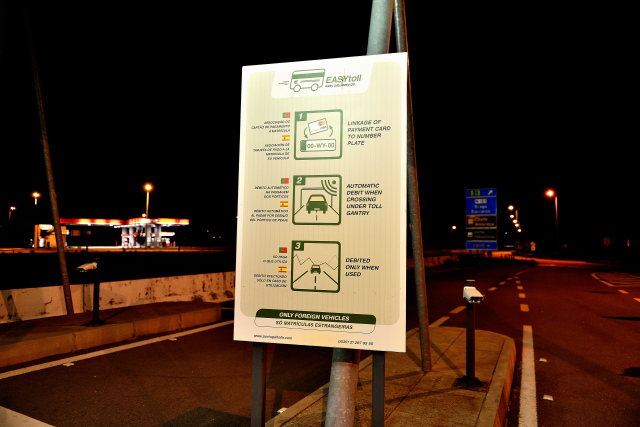 I left Viana do Castelo daybreak because taking the highway I was to find the Easytoll terminal to record my credit card and the plate number of my vehicle because the highways of the north and the center of Portugal are FreeFlow. It is beside the service area in the south of Viana, bingo I found it. 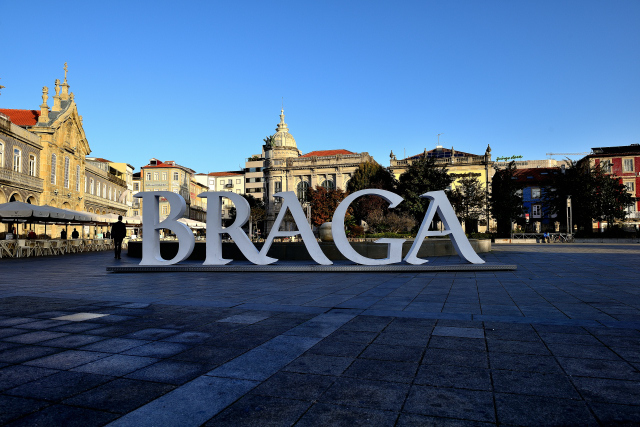 I continued my road to Braga where I had located a surface carpark close to the downtown area. I began my initiatory trip around 9:00 to complete it at 12:00 return to my truck. I had made a drastic selection to save my legs and my pathology! The cathedral held my attention with its vaults, its high altar and especially its two organ cases of share of other of the nave. The treasure exposed some beautiful pieces of gold goldsmithery encrusted with precious stones. Then I visited Palacio back Biscainhos lodging the eponymous museum in particular exposing a sumptuous Tibetan chain of death's heads out of ivory. Back to my truck I passed in front of the antigo Paço Episcopal opposite a garden where throne the fountain of Holy Beard. At approximately four kilometer away I climbed a great number of steps to admire the sanctuary of Bom Jesus preceded by a monumental baroque staircase. After two Christian sanctuaries reached in the pain I hope that my karma improved; I am an enthusiastic ecumenist! I was going to pose my bivouac on a carpark little before Gérès at the edge of an artificial lake. 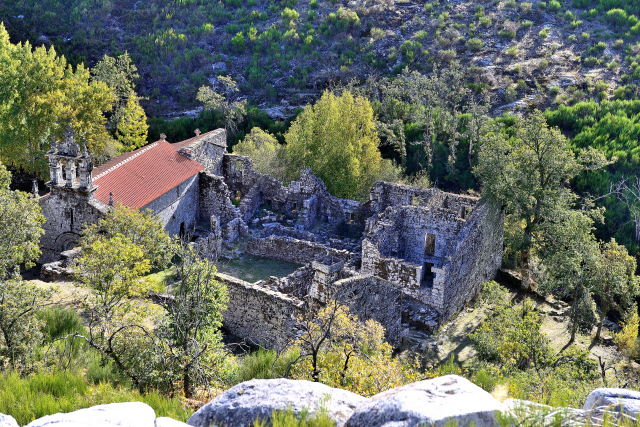 On Friday, October 27th I traversed the High valley of Cavado with for objective visiting the Roman ruins of a Benedictine monastery built in the 9th century at the wisigothic time. On the way I discovered the devastations of the recent fires in the beginning of October; I have much difficulties of accepting releases due to extreme climatic conditions. Moreover the administrative authorities implied with intentional acts! Many villages are fixed on mountainside; I am surprised density of urbanization of Portugal. Admittedly after two last years in Americas I returned in the ancient Europe where space is restricted. My bivouacs were car parks, I am happy to be able to remain in open nature though it seems that the wilderness camping is prohibited in Portugal. Readers will be able to be astonished by my prose strewn with Anglicism. I incite them to read the work by Régis Debray, “Civilization, how we became American”. Very interesting! 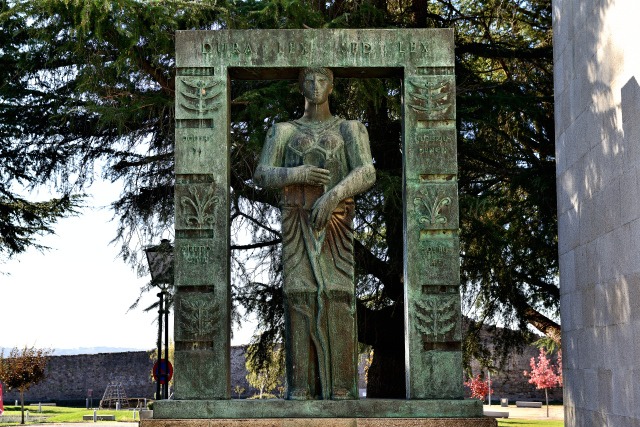 At the menu of October 28th I visited in Chaves the Roman bridge built under the emperor Trajan in the 2nd century. Then at the entrance of Bragança the Benedictine monastery de Castro de Avelas built in 12th century of which there remains only the apse and the bell-tower in apron. 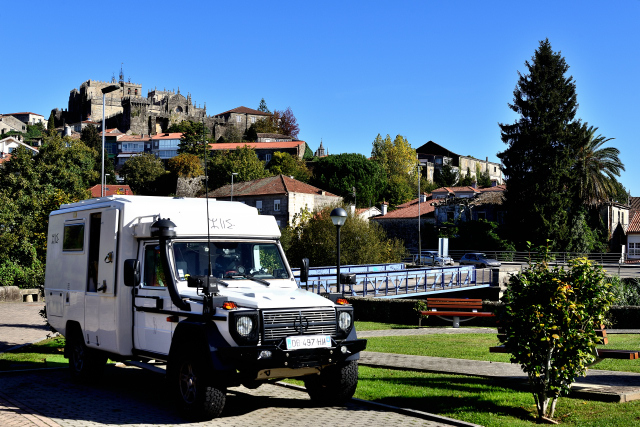 Bragança is a frontier town whose low city is around the cathedral in Paça da Sé. The high city is surrounded by wall and groups at the bottom of 33 meters high donjon. The service area reserved for the motor homes is at the bottom of the high city. This part of Portugal is located into medium mountains with an altitude of around 1100 meters. The road whose surface is of good quality, curves in rolling mountains among skimp pastures and of skinny vineyards. On Sunday, October 29th was still a beautiful quasi spring day although the morning temperature was of 11°C. Despite everything the forest had taken autumnal colors but of-here beyond the fires traces on mountainside letting had left forecast wild burn-beatings! I made three stops. 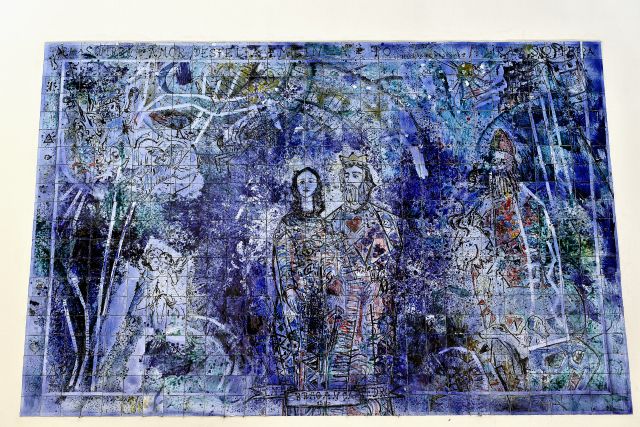 The first in Miranda do Douro visiting the hurdy-gurdy girdled city of its medieval walls with in the center the cathedral equipped with a sumptuous retable by Hernandez and Velázquez as well as child Jesus capped with a top hat and decorated with a complete wardrobe. Then I made a detour to see one of the five dams builds on Douro natural border with Spain. Finally in Freixo Espada-a-Cinta an old strengthened city of which there remains only the keep overhanging the cathedral and the cemetery was deserted and sights closed to tourists. In the far I surrounded the telephone towers at the bottom of which I bivouacked.